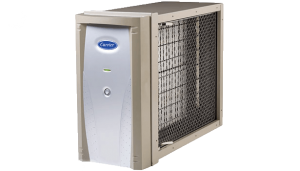 At Cal Air Cooling and Heating, we are a Carrier Factory Authorized dealer, offering you nothing but the best in air conditioning and heating products. Carrier is a top brand that is trusted to provide only top quality products for your home. Our company had to meet the strict guidelines of Carrier to be able to be given the certification title and we can now provide environmentally friendly products that are energy efficient and provide quiet comfort for your home. When it comes to heating and cooling products, we have you covered. We offer a wide variety of products from central systems to furnaces in both gas and electric models. 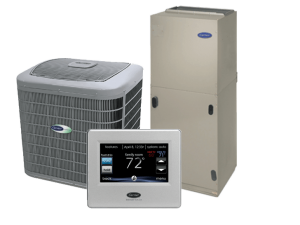 You can have a brand new system installed or we can offer you a replacement unit for your home heating and cooling needs. We understand that you may also be in need of parts and components for your HVAC system. We also keep these parts on-hand so that we can quickly provide repair service when needed. Indoor air quality is important in the home as you want to be able to breathe easy while enjoying your space. There are several products on the market today that can improve the air quality of your home so you can have less allergies and asthma attacks and cleaner, more breathable air. A Carrier Infinity air filter, the whole house purifier that we carry, can provide you with the much needed clean air in the home. Smog, dust, dirt and even pet dander can cause poor air in the home that can be a major health risk. With this special purifying system, you will be able to protect your family from such pollutants. With your home heating and cooling system, you will need quality control systems as well. 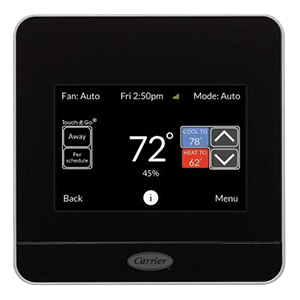 At Cal Air, we provide top rated thermostat solutions as well as controls so you can be in control of your HVAC system. Options include programmable thermostats, which allow you to set the desired temperature whenever you wish. You can set a different temperature for while you are away for energy savings and set the unit to turn back on before you arrive so the home is comfortable when you walk in the door. Our technicians will be able to provide you with information on the thermostats and controls so you can choose the right option for your home. Overall, we can provide you with quality comfort in the home. With our wide range of Carrier products, we are fully-equipped to provide the essentials you need for heating and cooling comfort in your Las Vegas area home.